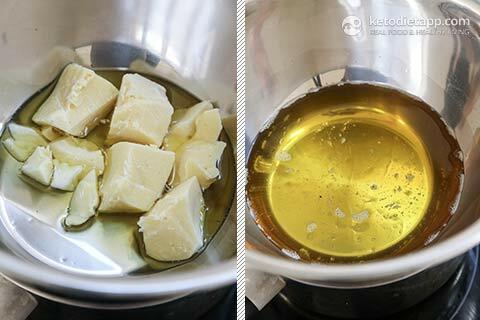 Today I&apos;d like to share my favourite recipe from the Fat Bombs Book: homemade sugar-free white chocolate. I&apos;ve used it in several recipes throughout my book: in bars, fudge, as coating for truffles, and even to make hot chocolate! Creating white chocolate that is sugar-free and milk-free wasn&apos;t as easy as I thought. 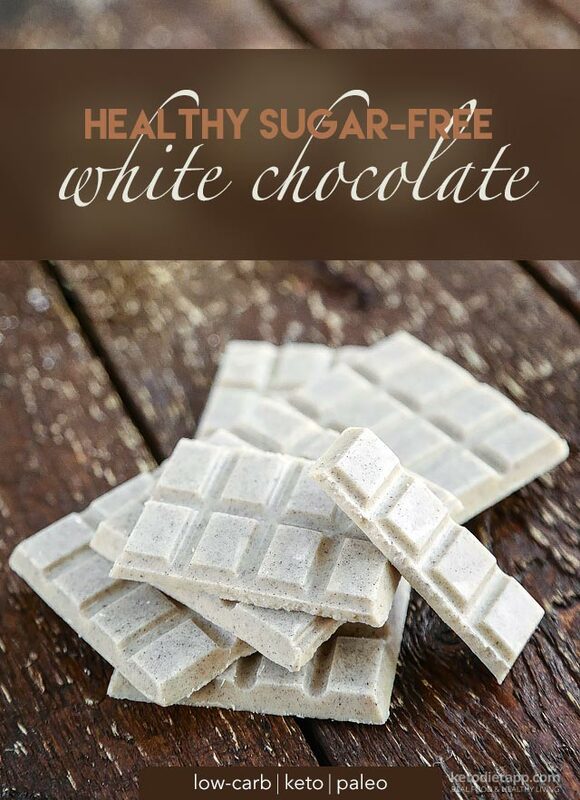 When you look at the main ingredients of a typical white chocolate bar, it&apos;s sugar and milk powder, both of which should be avoided on a ketogenic diet. Sugar can easily be replaced with a healthy low-carb sweetener such as Erythritol. However, finding a good replacement for milk powder wasn&apos;t easy. Without it, the chocolate just tasted like sweetened cocoa butter with a hint of vanilla. First, I tried to replace the milk powder with whey protein but I wasn&apos;t happy with the results. After some trial and error, I used coconut milk powder, which is not only keto but also paleo-friendly, and it was the closest I got to "proper" white chocolate. 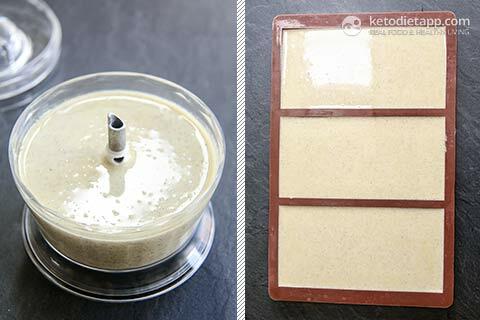 Where to Buy Keto & Paleo Coconut Milk Powder? Coconut milk powder is dehydrated and powdered coconut milk. It&apos;s naturally high in fat, low in carbs and suitable for the ketogenic diet. To avoid unwanted ingredients, always make sure you read the label before purchase. Because of the naturally high-fat content, the vast majority of coconut milk powders contain additional ingredients, such as maltodextrin, tapioca syrup, or oligosaccharides to reduce clumping and improve dissolving in liquids. Opt for products with paleo-friendly tapioca maltodextrin (instead of the widely used corn maltodextrin). The amount of maltodextrin is negligible (no more than 3%), and won&apos;t kick you out of ketosis. Although I expected all coconut milk powders to be dairy-free, not all of them actually are. Some contain casein (sodium caseinate) - avoid these products if you are allergic to it or follow a paleo approach. This Coconut Milk Powder is a great option if you live in the US. If you live in the UK like I do, try The Taste Of Coconut Milk Powder (100% coconut milk powder), or Real Food Source Coconut milk Powder (is 97% coconut milk, contains less than 3% of tapioca syrup and dissolves well). Note: For this recipe, I included two methods. You can follow either one. 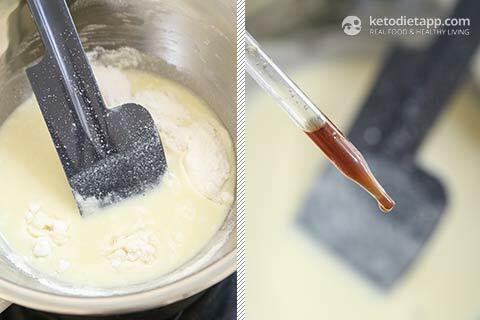 In the first one, I used coconut milk powder, while in the second one, I substituted half of the coconut milk powder with homemade sweetened keto condensed milk. Method number 2 can be found here. Don&apos;t make the same mistake I did and don&apos;t use the chocolate to make cookies unless you use a stabiliser like sunflower lecithin! Without the stabiliser, it doesn&apos;t work the same way as regular white chocolate and will melt into an unpalatable mess. Below is my failed attempt of white chocolate & macadamia cookies. They were too oily (all the fat leaked out) and the taste and texture were just wrong. Melt the cacao butter in a double boiler, or heat-proof bowl placed over a small saucepan filled with 1 cup of water, over medium heat. Remove from the heat and set aside. Add sunflower lecithin (if using). Add the coconut milk powder, Erythritol or Swerve. Note: If your coconut milk powder has clumps, place it in a coffee grinder, blender or food processor and and process for a few seconds until powdered. Add vanilla powder (or vanilla extract), and salt. If you want a sweeter taste, add a few drops of stevia. 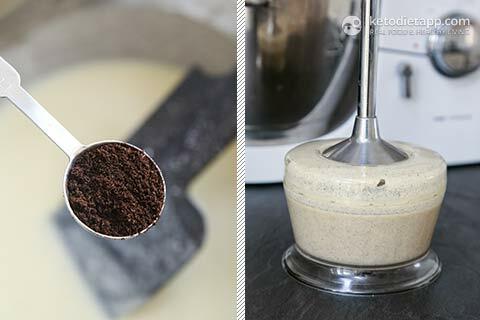 Pour the mixture into a food processor or blender. Pulse for 30 to 60 seconds, or until smooth. Tip For an extra nutritional boost: Swap 1/2 cup (60 g/2.1 oz) of coconut milk powder with 1/2 cup (40 g/1.4 oz) of lucuma powder. Lucuma is an anti-inflammatory superfood that will add natural sweetness to the chocolate, and make it creamier. 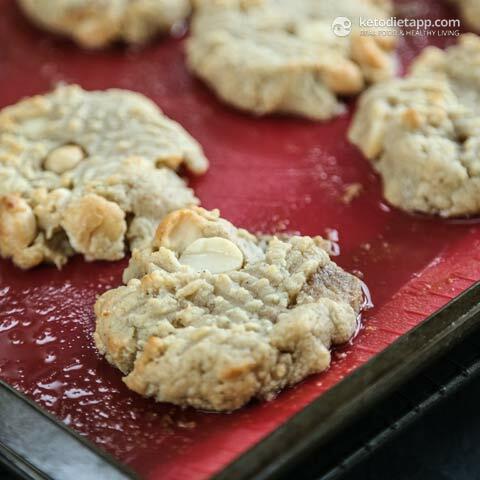 Using lucuma powder in this recipe will result in 4.3 grams of net carbs per serving. Once solid, remove from the molds. Store at room temperature or refrigerate for up to 3 months. Enjoy! Unfortunately I am another one who has failed with Method #1. Exactly as the others have reported, my mixture also separated when I blended it. To be honest, it actually looked okay, if very thick (spoonable rather than pourable into the moulds), before I blended it, so next time I may attempt this without blending. Reading everyone's comments first, I took the effort to sieve the coconut milk powder, powdered Erythritol and the pinch of salt, combining them up separately before I added thisto the mixture, so maybe that helped the pre-blended mix appear homogeneous? Anyway, not one to waste food, I salvaged this by adding about a cup of regular unsweetened milk powder (as I was making this for my husband who is not on keto... I know this will add carbs and not make it dairy free) to soak up some of the separated fat, quickly poured it into the moulds and popped it in the freezer so that it cooled fast, hoping that this would prevent the cocoa butter from having the time to separate. This seems to have worked and I popped them out of the molds, tasting a tiny bit before I wrapped them... Not bad. Not quite white chocolate but this will do for now  Sorry Martina, I'm gutted this didn't work but I will also try Method #2 another time. I'm so sorry Anu, this is very frustrating and I'm sorry about the ingredients :-( I'm glad you could at least make it for your husband. It must be the coconut milk powder. I got mine without any fillers (it's pure coconut milk powder from Amazon). At least method #2 seems to be working for everyone but the chocolate does need to be refrigerated at all times. Thank you for your feedback! 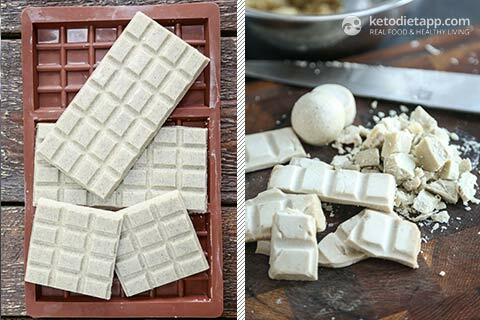 The best keto dairy free white chocolate I've tried so far! Not like white chocolate but close enough  I used the first method and it was good. There was some separation but I mixed it between pouring in the form and it was perfect. I'm making coconut condensed milk to try the second option. Hi! I’m a bit new to the blog but I’ve been enjoying the recipes and the keto app quite a lot. 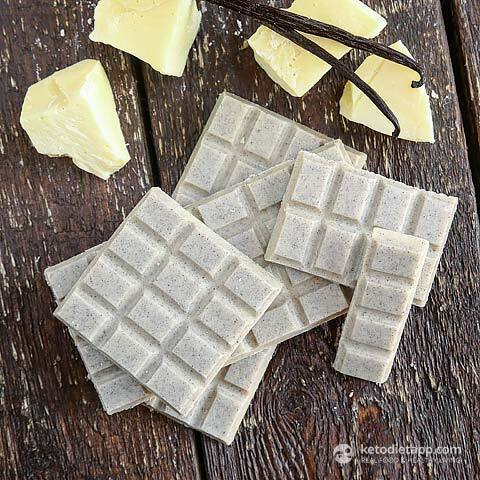 I’ve tried the regular chocolate and this white chocolate recipe but both feel so oily it makes me a bit nauseous. I know they’re supposed to be fatty for the diet, but how would I go about cutting out some of the oil’s strength? I seem to have failed with recipe #1 as well, even using the recommended dried coconut milk. I wondered if it was a moisture issue? I found a way to salvage it by adding coconut cream. At first try, I had a huge globby mess—like a hard candy nougat covered in cacao butter. I put it all back in a double boiler and melted it, adding around a 1/4 c of coconut milk (I didn’t measure, I added it until when stirring, the cacao butter made tiny globules within the mix, not a layer). They just popped out of the molds and are creamy white deliciousness! Thank you for another yummy, yummy recipe! I was reading that the issue with ingredient separation may also be due to high cooking heat. Does coconut cream produce the same result as coconut milk that's been cooked down? Also, my coconut milk is not as thick as yours in the picture. Do I need to cook it more to remove more of the water? Hi Tova, the condensed milk works as it has less moisture and the taste is more concentrated. Some coconut milks contain guar gum - these are usually better as it thickens faster. I used a combination of Aroy-D (liquid and no guar gum) and regular canned coconut milk. I would avoid using just 100% coconut milk as it won't thicken. Hi...i ha e been trying to substitute erythritol and stevia in my traditional indian desserts but while some end products taste good the others are not so basically because of the lingering aftertaste of artificial sweeteners. In your considered experience is there a ratio or proportion in which the two should be used for best taste experience? Also are there any foods/ingredients that dont taste good with artificial sweeteners? Thanks. I tried method 1 and it was kind of a disaster. I don't know what happened, but my non-clumpy coconut powder turned into a glopy sludge at the bottom of my vita mix, with the cocoa butter and sweetener floating on top. I could not get the two to come together no matter what I did. I followed the recipe as shown. Thoughts? I'm sorry to hear that. It seems that it is due to the other ingredients that may be in the coconut milk powder - it is not always easy to find pure coconut milk powder and many products contain other ingredients (see my comment in method 2, it is a known issue). Hi there, we are really having a lot of success with your fat bomb recipes but this one was a bomb for me! I followed the recipe to a "T" and I've read and re-read the recipe to see what I did wrong. The ingredients totally separated. Do you have any suggestions for me to try it next time? Thanks so much. Hi Beth, I'm sorry to hear that. I think it's the coconut milk powder that's causing it and some products result in failure :-( Have you tried the condensed milk option (Recipe 2 above)? It's a 100% success with everyone who's tried it and I think it tastes even better! Thank you so much Mary Anne! 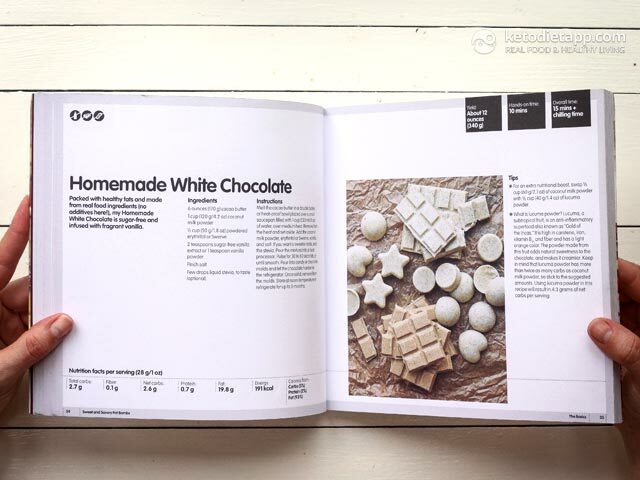 need to track down these ingredients, get some moulds and get busy in the kitchen! !